Announcement BIG NEWS . . . All you San Diego Babes are in luck! Come check out our new showroom starting June 1st! Come try on your heart's desires - call or text 805.574.9700 to book your appointment. Kat also offers bridal gown alterations to local brides!! Pssttt... Get social and snag yourself a coupon code while you're at it! Our exclusive Ombré dip dyed veils are taking the world by storm. Check 'em out while you're here! BIG NEWS . . . All you San Diego Babes are in luck! Come check out our new showroom starting June 1st! Come try on your heart's desires - call or text 805.574.9700 to book your appointment. I am so in love with my veil, that I would wear it everyday up until my wedding, if I was not afraid that I would tear it! It is exactly as I pictured and what Kat and I talked about prior to me ordering. I am beyond thrilled with this and I cannot wait to wear it on my wedding day! I made her a champagne Cathedral veil with blush ombré and custom 3D lace blush flowers scattered throughout the train! The excitement of getting published isn’t lost on me!! I honestly can’t believe my mother let me out of the house in the fifth grade. I was a tiny, amateur seamstress who could barely wind a bobbin. You should've seen the gobs of thread I wasted and the knots I got my mother’s sewing machine into. My sewing skills were really starting to blossom, or at least that’s what I thought. The early 90’s was the era of bodysuits and chokers, which is funny because today's fashion has come full circle since then. I can still remember my best friend Tamsyn’s yellow square neckline bodysuit she wore on the first day of school. I'd never seen anything like it and she was the envy of all. She coupled it with a black velvet chocker that had an emerald teardrop jewel dangling from the center. Her long horse-like mane glistened golden in the sunlight as we skipped to recess. We were young girls on the brink of womanhood. Our hearts longed for love, and if we had been presented with a fast-forward button to propel us into teenagers we surely would've pressed it. I grew up in a small Nor-Cal town where the closest retail store was thirty minutes away and our options were a tiny JCPenny or Kmart. Both of which were almost always entirely picked over, which didn’t really matter because money was stretched tight in my full family of seven. As the youngest, my wardrobe consisted of every hand-me-down imaginable; let's just say I didn't quite skip out the door with glee every morning. With three older sisters, my sense of fashion grew from their playing dress-up with me, forcing me by way of, “Come here, Kat, let me peg your pants.” I did as I was told and soaked up my sisters' wealth of beauty knowledge like a dry sponge. I began sewing Barbie clothes by the age of five, but my world altered upon witnessing the je ne se quoi that was Tamsyn’s yellow bodysuit. I was determined to make my own. Before that, I'd mostly worked with non-stretch cotton and felt a bit overwhelmed with the technicalities of zippers and buttons. However, that all changed when stretch knit fabric presented itself to me in the form of bodysuits. From then on out, my seedlings for fashion became an all-encompassing passion that would cause me many a sleepless night with fleeting visits of inspiration in my dreams. Dreamer, party of one. Thus the essence and origin of Veiled Beauty began long before 2008. Learning to sew as a youngster showed me how to create something from nothing. Creating something from nothing gave me value. With value came courage and the freedom to leave our small little town. With freedom, I curated not just a blossoming artistry I can call my own, but a lifestyle that was forged by diligence and fervor for the craft of creating. While friends relied on their mothers for everything growing up, I was inspired to pack my own lunch, style my own hair, sew my own clothes and walk solo to school. I was capable beyond my years and thrived in my new-found independence. Veiled Beauty was fashioned out of that very drive and independence. I stitched this business together with life lessons learned along the way. The integrity I hold Veiled Beauty to comes from my father, a man admired and respected by all. His accountability to God makes him the most just person I know. His kindness can be felt in conversation regardless if one's a stranger or friend. His example continues to instill in me standards which I provide my brides: with the careful attention and patience needed during this sometimes stressful but mostly exciting season of their lives. The ingenuity of Veiled Beauty and commitment to quality comes from my mother. Her resourcefulness is a spectacle to behold. Her out-of-the-box thinking made her a woman who could scrape two pennies together and fashion a delicious, beautifully presented dinner on a nightly basis. True to every stellar chef she started with fresh ingredients. She insisted upon putting the jam in a pretty serving bowl with a separate spoon. We set the table with a full setting at each place regardless if a knife was needed for that meal. Furthermore, she stood for quality from the inside out. Her meals were hearty, healthy, perfectly warm and most importantly made with love. She taught me to pour my heart into everything I do. She insisted on going that extra mile and never considered cutting corners. My mother showed me that, with a tenacity for hard work, love is first shown through your hands. Which color veil should I order? 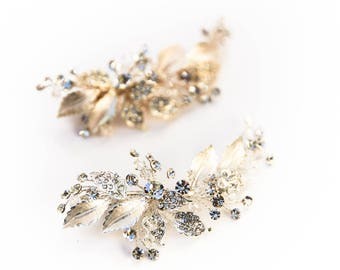 We encourage all our brides to take advantage of our SWATCHES! Photo filters and lighting variations can make pictures of your wedding dress unreliable when it comes to accurately depicting which color will match. Sleep sound, order swatches! What length veil should I order? If you like the look of the veil on our model we recommend ordering the length that is listed as "shown"! This will take the guess work out of the equation and give you a realistic idea as to how the veil will really look in person. What's the traditional veil lengths? If you're looking for a specific dimension, simply order the length closest to your desired measurement and leave us a note upon checkout. Message us for all other custom requests. How many layers on my veil should I order? 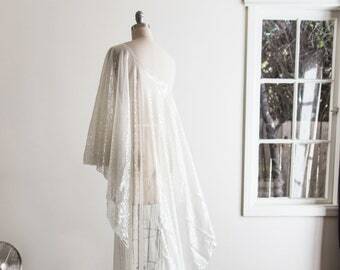 For a more simple look order a single layer veil. 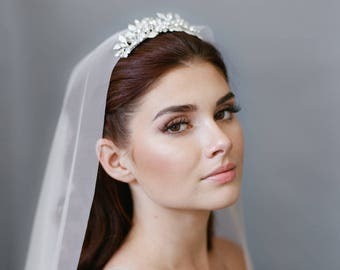 A double layer veil is referred as a "Two Tier Veil" and often times the second, shorter tier is referred to as a "blusher". And What is a Blusher?? The blusher is a shorter layer on the veil designed to be worn over the face as you walk down the aisle for the traditional lifting of the veil! What's the different between Bridal Illusion Tulle & English Net? There are various qualities of tulle, however Bridal Illusion Tulle is the best because it has the smallest holes. It has a soft flowy look and feels weightless. It is the most sheer option for a transparent veil. It is prone to wander in a gust of wind which is why it's most often featured in the iconic "veil blowing in the wind" photos. English Net is so soft that brides can't resist it once they've felt it. The texture is thicker and more opaque than tulle. It's lovely for a single layer, falls straight down from the comb and wraps around your shoulders - look! It's not however the best option for a blusher (over the face look). Think Leah... who's under that veil? What is a drop veil? Think Kate Middleton or Kim Kardashian! A drop veil is a double layer or two tier veil that is cut from a circle. The two layers are created by folding the tulle or net in half. Blahh...blah... all you really need to know is if you like the look of a drop veil or not. In general drop veils have a soft cascading feel. What does "gather at the comb" mean? Traditional veils have gathered tulle or netting at the comb. Meaning a large portion of fabric is bunched up to create a ruffled look at the top of the veil. The gather adds volume and body. Think Carrie Bradshaw... and no, I'm not referring to the massive peacock on the side of her head. For a sleek no "gather at the comb" look think Lauren Conrad's or again Kim Kardashian's veil. Or better known as a Drop Veil. What is a Juliet Veil? Think back a few years to when Kate Moss got married. Got the picture? Incase you missed her iconic veil I'll spell it out for ya. 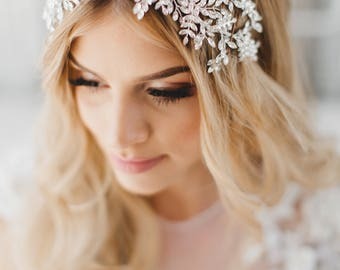 A Juliet veil is a 1920's inspired bridal veil where the tulle or netting gathers at the sides of the head near the ears. 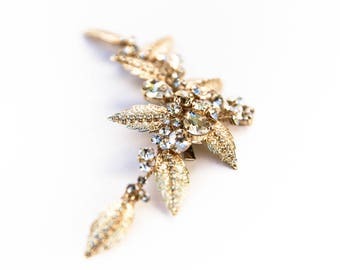 Often times it's embellished with flowers or lace.